Below are a selection of reviews for the leading satellite navigation systems with an emphasis on speed cameras - whether you are searching for a Christmas present or you have 9 points on your driving licence - a GPS speed camera detector can save you points, increased insurance premiums, time and money! There are many sat navs out there to buy which include speed camera locations in some form be it a third party POI (Point of Interest) database or a manufactures database. Rather than simply reviewing them all (as we've done in the past), we're reviewing the best ones that in addition to navigating you from A to B, also alert you best to speed camera locations across the UK and Europe. 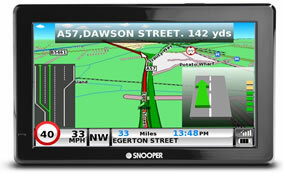 The best sat nav for the job of alerting to speed cameras in our opinion is the Snooper sat nav range. Why? Put simply it's only Snooper devices that use the AURA speed camera database. The AURA database is updated ever single day (most other databases are at best updated on a weekly basis), in addition Snooper have a range of speed camera detectors some of which have the ability to be updated live by the end-user such as the Snooper Lynx GT LIVE. The information is then also fed into the AURA database. The net result of which is one the best speed camera databases available! Please note: SpeedCamerasUK.com is not affiliated with Snooper in anyway. Our views are totally independent and based on more than 10 years in the speed camera detection market. Did you know? 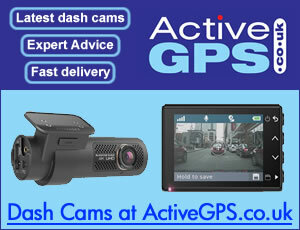 SpeedCamerasUK.com sells all the latest sat navs, to view them all click here. The all singing, all dancing Snooper DB8500 sat nav will quite literally have you singing and dancing thanks to its in built DAB digital radio and DVB-T freeview television. The DB8500 also features an impressive 7-inch widescreen LCD touchscreen, FREE traffic information to help avoid congestion and FREE lifetime map updates. Various DB8500 models are available for drivers of different vehicles including cars, trucks and motorhomes. Read more about the Snooper DB8500 Pro Sound. The Snooper S8000 Pro navigation device features an extra wide 7-inch screen, DAB digital radio and FM transmitter enabling you to tune your car, truck or motorhome radio to play your satnavs audio channel through your vehicles speakers. The Bluetooth enabled S8000 also includes FREE lifetime map updates and FREE traffic updates as you drive. There are three different versions of the Snooper S8000 including one for car drivers, one for truckers and another for caravanists. Read more about the Snooper S8000. The Snooper S6800 Pro navigator features a extra large 7-inch touchscreen display, making it perfect in vehicles where the windscreen is some distance from where you're sitting driving or simply if you'd like a larger display to refer to. The S6800 includes FREE TMC (traffic information) updates, is Bluetooth enabled and features a Mp3 and Mp4 player and is preloaded with either UK and Ireland or full European maps. Car, truck, bus and coach and caravan versions are also available. Read more about the Snooper S6800. Snooper DVR SC5800 sat nav features a 5-inch touchscreen display and includes an in-built driver vehicle recorder (video camera) to record traffic incidents. The SC5800 is also Bluetooth enabled providing hands-free calls. FREE TMC (Traffic Message Channel) service is also included as standard and alerts you to roadwork's and other congestion in the road ahead. As well as two different mapping versions: UK/Ireland and full Europe. Three different DVR SC5800 models for car, truck and motorhomes/caravans are available. Read more about the Snooper DVR SC5800. The entry-level Snooper S2500 sat nav features a 4.3-inch touchscreen display and FREE traffic updates and information. Two mapping versions: UK and Ireland and full Europe are available. Plus different models designed for different vehicle types are also available. Read more about the Snooper S2500. Speed camera locations for all of the above reviewed Snooper sat navs are available via separate subscription payable to the manufacturer at a cost of either £2.99 a month, £7.99 a quarter (every 3 months) or £29.99 a year.